Here it comes, Motor Trend’s Sport Utility Vehicle of the year 2015 has finally arrived at your Park Avenue Honda dealership. A functional and practical SUV that has marked generations of drivers and enthusiasts with its admirable road behaviour and classic design, the Honda CR-V strikes back with its new and ecstatic 2015 edition. One of the best-selling SUV since its introduction in 1995, the Honda CR-V recently received a preferential, mid-generation treatment that has greatly enhanced both its design and performance. More dynamic, more explosive and definitely more fuel-efficient that in the past, the all-new 2015 Honda CR-V is fitted with the Japanese manufacturer’s most recent technologies and delivers engaging and thrilling driving sensations. Well known for its reassuring and predictable road behaviour, the all new 2015 Honda CR-V benefits from a wide range of modifications that greatly contribute to enhance its driver’s and passengers’ experience. Slightly stiffer and nimbler than in the past, the latest edition eats up the miles with an unknown ease, thanks to its revamped suspension and all-new powertrain. Speaking of which, the spectacular, direct injection Earth Dreams 2.4-litre 4-cylinder engine that powers the all-new 2015 Honda CR-V is sourced from the Accord and generates 185 horsepower as well as 181 lb-ft of torque, which is 18 more than in the 2014 model. Paired with this modern beauty is an extremely efficient Continuously Variable Transmission (CVT) which provides better gas-mileage as well as vigorous acceleration and easier passing maneuvers. Moreover, the available real-time all-wheel drive with intelligent control system provides better grip and therefore superior agility on all surfaces. A reflection of its all-new, modern heart, the 2015 Honda CR-V boasts a refreshing and considerably more authoritarian exterior design. This sleek design starts with the striking front grille which instantly catches the eye. 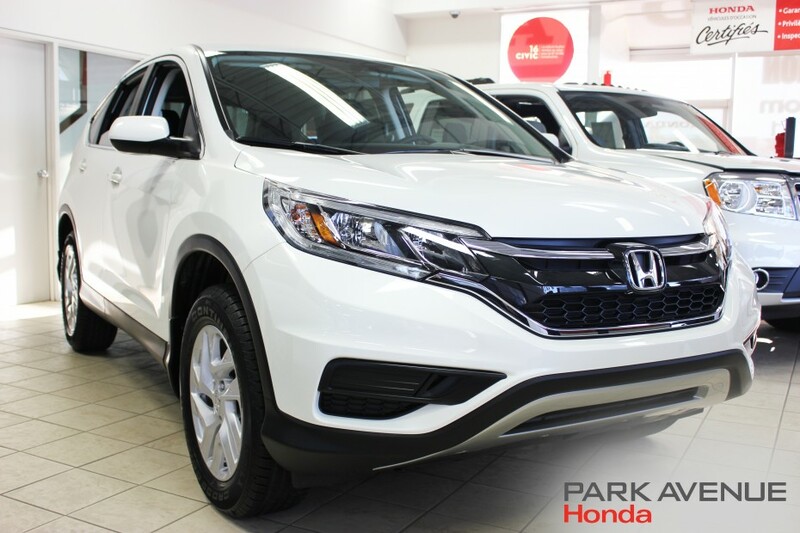 To this bold statement of design are added multiple elements such as more muscular bumpers, tapered fog lights and oversized wheels that greatly enhance both the CR-V’s good looks and stability. One of the most spacious vehicle in its category, the 2015 Honda CR-V earned its stripes and boasts a cabin as inviting as it is elegant. As usual, fit and finish is exceptional which helps create a strong impression of confidence and safety. Both comfortable and sleek, the luxury-inspired seats meet and exceed expectations thanks to superior lateral support and heating as a standard feature. Moreover, the extensive use of acoustic insulation materials greatly improve soundproofing and help create a quiet and pleasing atmosphere, even on long journeys. Brilliantly designed and inspired from the V-shaped grille, the dashboard boasts superb ergonomics which help provide a simpler, more intuitive experience. Thanks to a sleek facelift and extremely efficient powertrain, the all-new 2015 Honda CR-V makes up for its previous weaknesses and delivers a more thrilling, yet just as safe and comfortable driving experience.